If any. 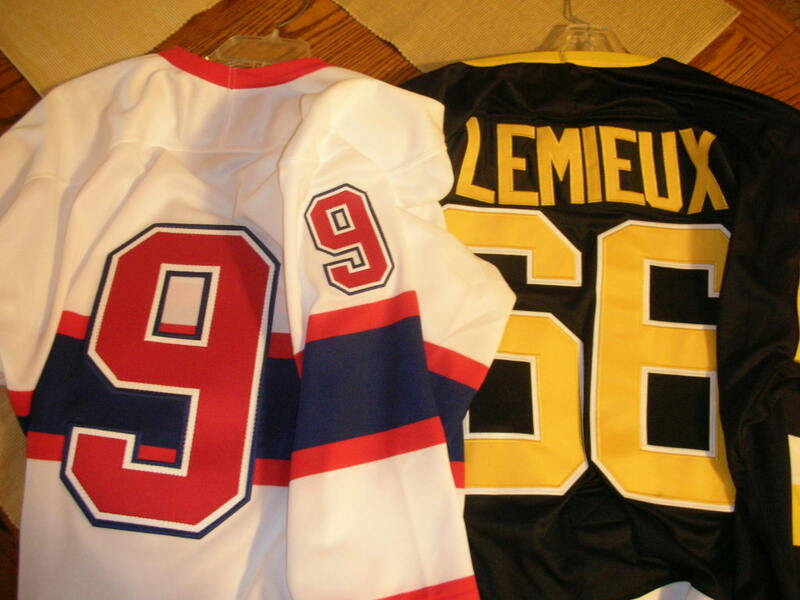 Thinking about a vintage Orr, or North Stars Modano. 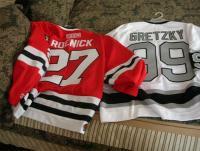 and two beer league jerseys with yours truly on it. One Home Jersey of the habs whore and signed by Maurice ''the Rocket'' Richard!!! and a Vancouver Canucks current home jersey - Roberto Luongo #1. Ended up passing on the Orr and Modano throwbacks. ...Peluso was picked up by Ottawa in the expansion draft the very next day. My other brother and I still razz him about it. HAHA, that being the main reason I never buy jerseys of current players. Possibly getting Bieksa, Manitoba Moose game worn jersey that he just wore in his 1 game conditioning stint this week. 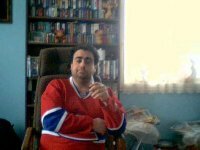 - Gary Roberts jersey, its blue, cant recall if that was home or away during that year... It's got the 'C' on the front, after he carried the team on his shoulders during the playoffs when Mats was injured. The idea was (and it happened all the time): somebody would say "hey, Roberts isn't captain!" and I'd reply with "ya coulda fooled me!" 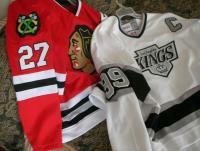 I'm deciding if I want to buy a 93 Gilmour "A" jersey, or a 17 Clark "C" jersey, or possibly one of the vintage jerseys with 17 Clark "A"
Gretzky - Kings one I picked up last week. Put JR on Jesus's love cloud too, you know, since it's NHL '94.com. 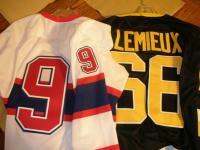 Got a Lemieux '92 finals jersey and a Maurice Richard a few weeks ago. I have a mid-90s leafs one with the jaggedy leaf, and I think a sens one somewhere. This video makes me laugh. I don't know, as a kid i never minded wearing other team's jersey, and actually prefered it. 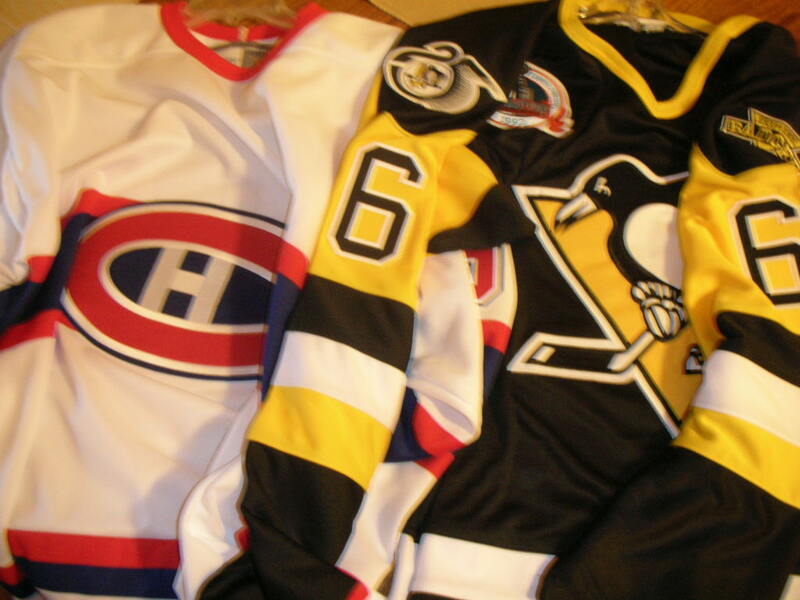 Just can't seem to like the Canadiens outside of the real thing (watching the games) Jerseys and Video games, my favorite are probably Buffalo and Edmonton. I only have a Mike Richards jersey, my brother (NJK/Monkey) has a Shanahan green Whalers jersey, Dionne gold Kings jersey, Hull throwback Red Wings jersey, and a Rod Brind'Amour Michigan State jersey. Nicklas LidstrÃ¶m from All-star game 2001, autographed. - Reebok: NYR, Jaromir Jagr, Blue, Captain "C"
- Reebok: NYR, Jaromir Jagr, White, Captain "C"
EDIT: Just purchased me a home norquiqes jersey. Wendel Clark suckas. theres a plus side to it my name is Kendall Clark .